Annual training of staff is essential for many companies and industries but it can be ridiculously unproductive. In many situations, even the trainers don’t believe in the value of what they are doing, particularly when faced with a group of employees wondering how the subject matter relates to them, wishing they were back doing their job, or a combination of both. I see this a lot but I also see that with a dose of creativity and an understanding of how employees like to learn (and what gets the best results), it is possible to turn annual training, including compliance training, from something that is a strain on everyone involved into something that measurably improves the business. 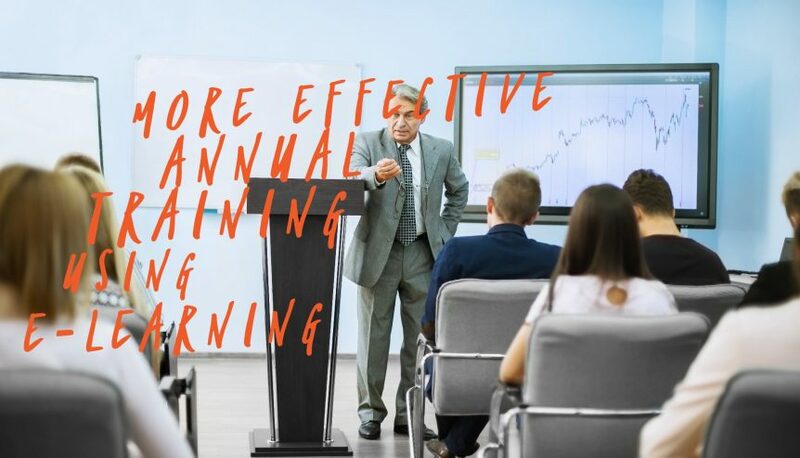 Annual training is important because it improves the abilities of employees. It can also improve self-confidence, help employees to progress their careers, and encourages them to remain in employment with you. Annual training also helps to improve the performance of your organisation. This could be by, for example, improving customer service or teaching employees how to work more productively and efficiently. Additionally, in many situations, annual training is a regulatory requirement. Where this is the case, effective training will help keep your company on the right side of the law. The problem is annual training is often regarded negatively. This is particularly the case with employees going through compliance training. Many of those employees find the training irrelevant to what they do, tedious, and disruptive of their efforts to hit targets and/or maximise their work performance. E-learning deals with this negativity. It can also ensure your organisation achieves better outcomes from annual training generally. From the employee’s perspective, they don’t have to leave their work environment to complete the training. In addition, you might be able to make the e-learning course asynchronous so the employee can complete it at a time that best suits them. Microlearning – where you break course modules into small, bitesize chunks that learners can quickly complete. Spaced repetition – where you gradually increase the intervals between reviews of previously learned material as the information embeds in the learner’s memory. Gamification – adding elements of interactive fun that engage learners. Regular learner feedback – so learners can see their progress and understand areas they must improve. Ongoing assessments – so you can check the progress of learners. Lowers costs – as employees don’t have to travel to attend a course. This is particularly important if you have a distributed team. Easy to track – the deployment of annual training is easily tracked across your entire workforce when you use e-learning as the method of delivery. This gives the ability to quickly see which employees have completed the training and which haven’t. Consistent delivery – e-learning ensures all members of staff receive the same level of training. Fits in with the schedules of workers – there is less impact on worker productivity, particularly if they are able to complete the training on their own time. Measurable results – it is easy to monitor performance and retention rates while learners go through the training and when they complete it, as well as in the months that follow. You are likely to need professional help to create an e-learning course that includes the elements above and delivers on your objectives. The payoff, however, will be substantial.